This started off as an experimental piece, I bought a pack of 2 larger black canvases (18”x24”) to play around with & was not totally sure what I was going to do with it but knew that I wanted to try something new. After some thought and staring at the blank canvas I decided to re-create number 31 of my Inktober sketches; it is one that I wanted to expand on since the small sketch was created. I started of with a light pencil sketch – lighting is very important as graphite is a bit hard to see on black, so doing this with angled light or in front of a window helps – once the sketch was complete I used tinted charcoal with some light pastels to make the illustration pop. I was pleasantly surprised with how it turned out! Shortly after selling it, I started to sketch out a design for the second black canvas. More on this to come once complete. Follow me on my social to see my process & projects happening in real time. I was planning on making a post for this in late November after the course…but it did not go as planned, late is better than never right! The airbrush course was AWESOME! if you are interested in airbrushing this is an excellent course to take, the instructor is very knowledgeable & has his shop open to people looking for a place to airbrush every Wednesday after 5 (unless otherwise posted) so people can get together & help each other out with their projects or just to hang out & have a good time, how awesome is that?! The first day we started off with learning how the airbrush works & different parts of an airbrush, later which are good ones to get along with some tips & tricks the instructor has leaned from trial & error or through others he knows in the industry. Then we discussed paints, mixtures, where to buy it, brands, solvent vs water-based, etc. & learned about some resources available in Edmonton to find supplies. Later we learned how to do proper dagger strokes, dots, shading & messed around with some stencils before starting our project. We learned how to properly prep surfaces, about paper tape masking, layering & finally started the painting process. The second day we had a bit of a review with a bit of Q & A, some warm up/practice before continuing on our projects we later finished that day. We also learned that if you ever need any clear coating done it is very dangerous to attempt at home without the proper set up – while the paint is curing the fumes become lethal. Our instructor informed us to get it done at a body shop with a proper paint bay – he also does it for about $25 (depending on the size of the project I would assume that price could go up). This keeps you & your family or whoever you may be living with safe, not to mention the clear coat finish is applied by a professional! I was talking to the instructor, we both felt we had met before, as it turns out he has participated in Edmonton’s Artwalk a few times the last couple of years & it was actually one of his pieces that got me interested in airbrushing! I remember going to my first Artwalk with my boyfriend & seeing this amazing elephant painted on metal that had some grinder designs in it, it was amazing & I was inspired to try it! Here is a screenshot of the elephant off of his website bakerboyzdesigns.ca, as usual pictures do not do it justice as seeing it in the daylight where all the colours & details are visual. But You can check out his work & business on this site, portfolio is awesome! Elephant by Baker Boyz Designs inc. I am very excited to do more airbrushing with the new found knowledge in my brain, to practice & make pieces for people. I already have a cool project in mind that I cannot wait to start for my dad’s enclosed trailer! HAPPY NEE YEAR!!! & a HAPPY BIRTHDAY to my Mom!!! 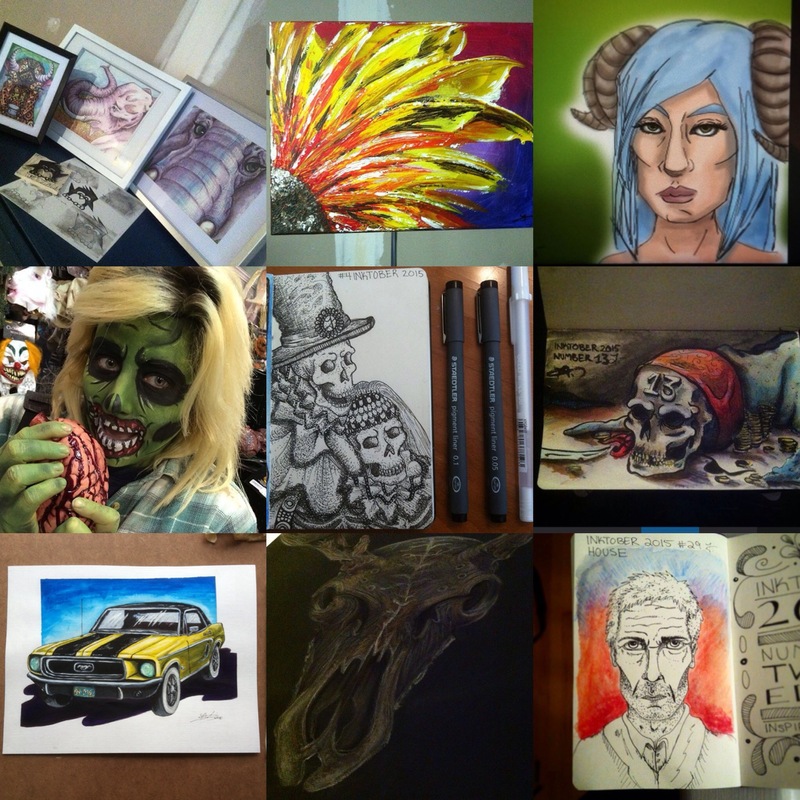 Here is a bit of a throwback on 2015 experimenting with ink & watercolour, stamp making, acrylics & pallet knives, digital drawing, facepainting, my first inktober, playin with some tinted charcoal, finally some more acrylic & ink illustrations. Looking forward to what 2016 will inspire!